Linux, the kernel developed and distributed by Linus Torvalds et al, contains non-Free Software, i.e., software that does not respect your essential freedoms, and it induces you to install additional non-Free Software that it doesn't contain. Even after allegedly moving all firmware to a separate project as of release 4.14, Linux so-called "sources" published by Mr Torvalds still contain non-Free firmware disguised as source code. GNU Linux-libre is a project to maintain and publish 100% Free distributions of Linux, suitable for use in Free System Distributions, removing software that is included without source code, with obfuscated or obscured source code, under non-Free Software licenses, that do not permit you to change the software so that it does what you wish, and that induces or requires you to install additional pieces of non-Free Software. Our releases can be easily adopted by 100% Free GNU/Linux distros, as well as by their users, by distros that want to enable their users to choose freedom, and by users of those that don't. Although UTUTO-e was the first GNU/Linux distro to remove non-Free portions of Linux, GNU Linux-libre follows and improves on the practices established by gNewSense and BLAG. Free Software Foundation Latin America (FSFLA) joined the (then non-GNU) Linux-libre project as part of its campaign dubbed "¡Sé Libre! ", to encourage and enable users to go beyond using some Free Software, and rather seek and choose freedom. releases: source tarballs tracking upstream releases, from which we removed blobs and code that induces users to install non-Free Software. SIGNING-KEY: The GnuPG keys used to sign source tarballs, patches, Freed-ora packages, and the keys that sign other repositories. For each repository R, there's a corresponding SIGNING-KEY.R in the download tree. freesh: .debs for various architectures of the latest sources available. Read more. freed-ora: .rpms packages tracking Fedora kernel builds. Read more. freeloong: .debs for gNewSense/mipsel, for Lemote Yeeloong laptops. Read more. libeRTy: .debs compiled with the PREEMPT_RT patch for realtime operation on 32- and 64-bit x86 CPUs. Read more. planet: (OBSOLETE) old .debs for 32-bit x86 of then-recent sources. Read more. freed-ebian: (OBSOLETE) .debs tracking Debian kernel builds. Mirrored from Robert Millan's repository. rt: (OBSOLETO) .debs of recent sources with real-time support. Read more. Mirrors: The repositories above are available from our network of mirrors too. Other binaries: There are other distributions of GNU Linux-libre binaries from third parties. We maintain a list. Deblobbed ipu3-imgu. Updated deblobbing of admgpu, adreno, tegra, bnx2x, iwlwifi, mt76x0, qtnfmac, and Intel SOC sound (.ri and .tplg added as extensions to flag). Dropped deblobbing of removed Eicon DIVA ISDN driver. Jason Self has started maintaining the libeRTy apt repository which carries .debs compiled with the PREEMPT_RT patch for realtime operation on 32- and 64-bit x86 CPUs. Thanks! Thanks to cyberbits.eu for the new mirror! 2018-12-24 - GNU Linux-libre 4.20-gnu - Four.Two-Oh! Ho! Ho! Disabled blob requests in MT76x0E, Lantiq/Intel GSWIP, and Microsemi PHY. Updated btrtl, AMD GPU, i915 CSR, PSP crypto, MT76x0U, MT76x2E, MT76x2U, qtnfmac, Qualcomm ADSP and Hexagon V5 Remoteproc, x86 touchscreen, hda ca0132, ath10k, and iwlwifi cleaning up. Dropped false positive matches for old patches. Silenced some harmless compiler warnings in reject_firmware. Adjusted README adjustments. Disabled blob requests in MT76x0U and MT76x2U WiFi, MTk Bluetooth UART, Keystone and Qualcomm Hexagon Remoteproc, and Aspeed ColdFire FSI Master. Updated AMD GPU, Adreno, brcmfmac, mlxsw, Intel Skylake sound and Silead touchscreen cleaning up. Mirrors in Ecuador, Romania, Sweden (also available in the Tor network), and USA East coast are now available. Thanks UTA and ESPOCH in Ecuador, Ernesto Pérez Estévez, Alin-Adrian Anton, Jonathan Sélea, and John Harris for the updates. URLs using http were changed to https where available. Introduced firmware_reject_nowarn; check for new firmware_request_nowarn and other firmware_request interfaces. Deblobbed psp-dev crypto, icn8505 touchscreen. Adjusted deblobbing of qat c3xxx and c62x crypto, dvb-usb, dvb-usb-v2, iwlwifi, ks7010, ath10k, andgpu, i915, tg3, silead, ca0132 hd audio. Dropped atom isp deblobbing. Checked for asm sources split out of amdkfd cwsr trap handler header file. Dropped deblobbing of Dreamcast Yamaha AICA, its firmware is Free Software, and of USB IrDA, removed upstream. Adjusted for firmware loader and builddeb reorganization. Updated deblobbing of i915, amdgpu, coda, s5p-mfc, wl1251, and brcmfmac. The codename -ENOTEMPTY celebrates that, after 10 days of truckers' strike that, despite broad support from the population including myself, led to shortages of fuel and many other products all over Brazil, I could finally refuel my car on Friday. Revamp reject_firmware_nowait so as give the callback a chance to run; return the expected -ENOENT from other reject_firmware variants. Obfuscate messages that might suggest the installation of non-Free microcode. Deblobbed mt76x2e. Update deblobbing of i915, nouveau, imx-sdma, iwlwifi, raydium-i2c, and silead_dmi. Dropped lirc_zilog. Clean up keyspan firmware Kconfig leftovers. Adjusted deb and rpm build scripts to refer to GNU Linux-libre. Disabled non-Free firmware loading in hideep touchscreen and brcmstb memory drivers. Updated the cleaning up of i915, adreno, amdgpu, tegra, silead dmi, and atomisp. Dropped cleaning up of ap1302 and oss drivers, removed upstream. Jason Self, of Freesh fame, put together a distribution of Free firmware for use with GNU Linux-libre: git repo and released tarballs. Deblobbed drivers for Cavium Nitrox CNN55XX, Inside Secure's SafeXcel cryptographic engine, Qualcomm Venus V4L2 encoder/decoder, Mellanox Technologies Spectrum, Quantenna QSR10g, and Qualcomm ADSP and WCNSS. Updated deblobbing for AMDGPU, Adreno A5xx, and Intel i915 CSR GPU, Atheros 802.11ac ath10k, Broadcom IEEE802.11n embedded FullMAC WLAN, Intel DVM and MVM, Redpine Signals WLAN, and Wilocity 60g WiFi, and Silead Tablet touchscreen drivers. Jan Prunk noticed some of our builds were lagging behind, and kindly offered another build server, the second offered by him. Thank you, Jan! Deblobbed Tegra gpu, AtomISP v4l, RTL8723BS WiFi, and HCILL and Nokia H4+ BT. Updated deblobbing of amdgpu, i915 csr and nouveau GPUs, and Skylake sound. Updated blob names for si2168 dvb, si2157 tuner, ath10k wifi, iwlwifi, rtl8723be wifi, rtl8821ae wifi, and silead touchscreen. Dropped deblobbing of WiLink NFC, removed upstream. Deblobbed Cavium Crypto accelerator, Rockchip gpu, Netronome NFP 4000/6000 ethernet and Silead touchscreen drivers. Added .out and .nffw to the list of extensions regarded as suspected blobs. Updated deblobbing of AMD and Intel gpu drivers, of the Qualcomm peripheral blob loader, of Chips&Media Coda media codecs, Atheros ath10k and wil6210 WiFi, Intel iwlwifi, and Intel Skylake audio drivers. Updated README. Deblob st_fdma. Update deblobbing of amdgpu, adreno, i915, radeon, iwlwifi, slicoss, bfad, and of alsa docs. Drop deblobbing of STE-Modem, removed upstream. Catch a general pattern of iwlwifi blob name prefixes. Enable blobless activation of RV7xx radeon cards. Deblobbed sun8i, Marvell Bluetooth support, ziirave_wdt, greybus. Updated deblobbing of amdgpu, mwifiex, wlcore, imx7s. Dropped deblobbing of r8723au, removed upstream. Corrected deblobbing of b43 and b43legacy to fix a blob name's leakage into error messages. Besides maintaining one of our mirrors, Jan Prunk has now generously offered us access to a build server. That will help ease the load on the one offered by the FSF, and get builds out faster. Thank you, Jan! Enable blobless activation of evergreen radeon cards. Deblobbed mtk_vpu, ks7010_sdio, raydium_i2c_ts, silead, qcom_q6v5_pil, qcom_mdt_loader, and rt5514. Adjusted deblobbing of media docs, mn88472, iwlwifi, skl, brcmfmac, radeon, i915_csr, and btusb. Deblobbed xhci-tegra. Adjusted deblobbing of radeon, i915 csr, mwifiex, brcmfmac, iwlwifi, ath10k testmode, rtl8xxxu wifi, hfi1 Infiniband, and skylake audio. Enable blobless activation of r600 radeon cards. Updated deblobbing of nouveau and skylake audio. Deblobbed melfas_mip4 touchscreen and ag6xx bluetooth drivers. Removed deblobbing of dgap and wimax gdm72xx usb drivers, removed upstream. Deblobbed qat_c3xxx, qat_c62x, adf7242, goodix touchscreen, Qualcomm WCNSS SOC. Updated deblobbing of radeon, nouveau, skylake sound, XHCI rcar. Adjusted for lots of code movement, especially within drivers/net/wireless. Deblobbed qed, fdp, nfcmrvl, rtl8xxxu, and rohm_bu21023. Adjusted deblobbing for revamp of early microcode loader. Dropped ft1000. Deblobbed c8sectpfe, s3fwrn5, Intel and Qualcomm/Atheros Bluetooth, HFI1 Infiniband, Intel Skylake sound. Updated deblobbing of amdgpu, nouveau, mwifiex. 2015-08-30 - GNU Linux-libre 4.2-gnu: "10% of the answer"
Deblobbed amdgpu, i915, cx24120, liquidio, mt7601u, wilc1000, hci_bcm, btrtl, and wdt87xx_i2c. Updated deblobbing of elan_i2c, rproc, cxgb4, ath10k, and brcm80211. Deblobbed nxp-nci and btbcm. Updated deblobbing of Intel SST, btusb, elants_i2c, iwlwifi, and various other frequently-updated blobnames. Robert Musial has managed to build a deblobbed kernel based on CentOS 7's blob-ridden one. It's available from the DeCentOS site. Fixed --force handling in deblob-4.0. Cosmetically deblobbed cyapa (the default blob name is unused: loading is always user-initiated, from user-supplied file, so it's fine) and ssp_sensors (blob names were cleaned up, but no loading machinery was encountered). Updated deblobbing and checking of nouveau. Dropped tlg2300. Deblobbed sti (gpu), mn88472 and mn88473 (dvb), ELAN (touchpad), me4000, wd719x, rt5677, and Intel SST IPC drivers. Updated deblobbing of tlg2300, brcmfmac_sdio, ath10k. Dropped deblobbing of bcm_wimax, removed upstream. Added new blob name patterns for adreno gpu, m88ds3103, mwifiex usb, and matches for various new false positives. Non-functional changes: standardized formatting of clean_kconfig and clean_mk commands in deblob-3.19; check that the Kconfig file given to clean_kconfig contains the named config tag, and fixed the various typos it caught. Improved EXTRAVERSION -gnuification to ensure there is a blank after "=". The deblob scripts are now signed, in past and future source releases. Scripts published as part of past source releases were verified against the history stored in the version control repository. In order to make this easier, and to make it easier for users to select stable sets of deblob scripts that work together, we now have per-major-release branches holding the latest version (and past history) of deblobbing scripts for that release. The first release coming out after each change to such a branch also gets a tag, so that every one of our source releases can be easily mapped and compared to a tag. See also the README file and the branches and tags subdirs within the releases tree in our version control repository. Remove deblobbing of usbdux comedi drivers, since the requested firmware is Free Software (thanks to Legimet for the report). Reduced timeout for disarmed blob loading requests (thanks to Cristophe Jarry for the suggestion). Improved the generic error message for blob load requests (thanks to Brian Candler for the suggestion). Fixed buffer overflow in deblobbed irda-usb (thanks to Lluvia for the bug report). Reduce divergence from upstream by avoiding unnecessary renaming of internal functions and field names. Updated deblobbing of msm (adreno GPU), radeon, m920x, bcm3510, or51211, sp8870, sp887x, tda1004x, as102, budget dvb, coda video, ft1000-pcmcia, netxen, qlcnic, r8169, bnx2x, iwlwifi-8000, rtl8723ae, rtl8188eu, rtl8192ee, rtl8821ae, lpfc, and qla2xxx. Deblobbed saa7134-go7007, ath10k testmode, wil6210, and knav_qmss. Dropped deblobbing of removed driver nokia_h4p. Remove external compression of uncompressible xdelta3 diffs. Freed-ora 8-1 RPM packages were released with an updated mirror list in the yum repository configuration files in the freed-ora-release package, and many additions to the freed-ora-freedom to help you keep your system Free from numerous non-Free kernel sub-packages and non-Free firmware and microcode packages, included in the upstream GNU/Linux distribution, but that were not yet recognized by the previous Freed-ora build. The packages are available in the testing repositories for F19, F20, F21 and F22. Ernesto Pérez Estévez tells us about two full mirrors in Ecuador, kindly hosted by ESPOCH and CEDIA. The mirrors serve http, ftp and rsync at URLs such as http://mirror.espoch.edu.ec/linux-libre/ and http://mirror.cedia.org.ec/linux-libre/. Thanks! Jan Prunk has renamed his gnulinux.tv mirror to gnulinux.si. The mirror at the University of Campinas has long been down. Disabled blob loading in the drivers for Intel QuickAssist Technology, Silicon Labs Si2157 and si2165, Broadcom IEEE802.11n PCIE FullMAC WLAN, xHCI support for Renesas R-Car SoCs. Adjusted cleaning up of go7007 driver, moved out of staging. Dropped deblobbing of wlags49_h2, wlags49_h25, keucr; the drivers were removed. Updated blob names in radeon, si2168, code v4l, s5p_mfc, xc4000, ti-st, ath6kl, brcmfmac, p54, and iwlwifi drivers. Lots of new blobs and blob requests had to be removed for this release: ast_dp501, radeon, drx39xyj, m88ds3103, si2168, s5k5baf, iwlwifi, rsi_91x, rtl8192ee, rtl8723au, rtl8723be, rtl8821ae, bt_nokia_h4p, mxuport, adau1761, and adau1781; dgap and sst-acpi are back after rewrites that required new deblobbing patterns too. Upstream dropped it913x and dgap drivers and added a few new blob names and corresponding requests, all deblobbed in 3.15-gnu. Nouveau and radeon also grew new longish sequences that turned out not to be blobs, so those are explicitly retained. Dropped checks for aic7xxx_old and cs46xx firmware and sources. Added reject_firmware_direct. Adjusted deblobbing of moved microcode loaders. Updated deblobbing of bnx2x, bt_mrvl, cs46xx. Dropped deblobbing of btmtk (removed upstream). Deblobbed cx24117, vpdma, wcn36xx, and btmrvl. Updated deblobbing of rtl8188eu, em28xx, ath10k, brcmfmac, iwlwifi, readon, and wl1251. Deblobbed msm, pn544_i2c, r8188eu, and dgap drivers. Updated deblobbing of s5p_mfc, bna, and bfa, and added expressions to match several new or modified false positives. Linked to gdnewhat and slack-n-free as sources of packages. Updated deblobbing of nouveau, radeon, comedi, x86 early microcode loaders. Deblobbed ath10k, cw1200, iwlmvm, mtmtk. Dropped csr_wifi. Updated deblobbing of iwlwifi, csiostor, go7007, siano sms1xxx, and radeon. Disabled non-Free firmware loading of newly-added drivers for btusb, ims-pcu, exynos4 fimc-is, and rtl8188ee. Fixed a deblobbing bug in radeon that affected cayman variants since 2.6.39. Restored the (now Free) firmware loading in ath9k (thanks, Jason Self, for the patches and for the firmware build!). Deblobbed Intel early microcode loader, s5c73m3, rp2, lp5521, lp5523, lattice ecp3, ca0132 dsp. Updated imx sdma, m920x, bnx2x, qlcnic, iwlwifi, mwifiex, wl18xx, wm_adsp deblobbing. Disabled non-Free firmware requests in newly-added drivers xrx200, ar5523, rtl8723ae, csiostor, and wm_adsp, and the new non-Free firmware requests in ath9k and nouveau (falcon). Updated deblobbing of lpfc and gdm72xx. Drop dabusb firmware removal, now removed upstream. Tolerate non-executable deblob-check script, and detect other likely error scenarios that would produce empty files. Fix detection of presence of source files along with pre-built binary counterparts within the source tree. Introduce conditional ihex firmware loading. Adjust for tree reorg within drivers/media. Adjust deblobbing for arm ixp4xx-npe and imx dts, nouveau, rtl8192e, wlcore, gdm72xx, s5k4ecgx, s5p_mfc, xc5000, bfad, ueagle-atm, and tda10071. Deblob daqboard2000, me_daq, ni_pcidio, ezusb_fx2, ste_modem_rproc and wm0010. Drop some of computone, cxgb3, keyspan_pda and whiteheat deblobbing and cleanups. Make deblobbing scripts immune to locale settings. Deblob csr-wifi and wl18xx. Adjust bcm, iwlwifi, wlcore, wl12xx, WiMAX i2400m, Comedi JR3, em28xx-dvb, and r8169. Drop iwmc3200. Deblob af9035 and wlcore. Adjusted deblobbing for nouveau, libertas, wl1251, wl12xx, gdm72xx, r8169, ath6kl, and mwifiex. Dropped 3c359, smctr and tms380tr. Deblobbing news: new az6007 and nfc wilink drivers needed cleaning up; radeon got new blob dependencies; xc5000, lmedm04, em28xx, bna, bnx2x, brcmfmac, iwlwifi, wl12xx, ath6kl and qla2xxx required deblobbing adjustments. Jan Prunk set up a new mirror. The server is located in California, USA. Thanks! 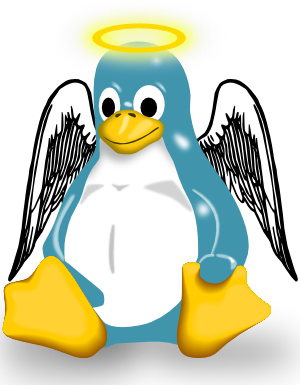 Linux-libre joins the GNU Project, becoming GNU Linux-libre. This release, 3.3-gnu, marks the transition, although upcoming stable releases based on earlier -libre releases may become -gnu releases as well. Deblobbing scripts now support .gz, .lz and .xz compressed inputs, in addition to .bz2 and uncompressed ones, and tarballs are now named linux-libre--gnu.tar. Few deblobbing changes were required for this release: deblobbing of drivers for arm imx, dib0700, it913x, em28xx-dvb, brcmfmac, iwl3945, iwl4965, and rtl8192e needed some adjusting, while wl12xx-sdio-test and snd-intel-sst are no longer present, and sigmadsp code moved about in the tree. Cleaned up newly-added drivers it913x, ath6kl, mwifi_pcie, usbduxsigma, as102 and r8192e_pci. Adjusted deblobbing for ethernet drivers, moved within the tree, and s5p-mfc. Fixed deblobbing typos in bt8xx, iwlwifi, libertas usb8xxx, vxge, and pcxhr. James Turner maintains binary .debs of recent Linux-libre releases for Lemote Yeeloong (mipsel) netbooks. Newly-added xc4000, drxk_hard, em28xx-dvb, s5p-mfc, rtl8192de, adau1701, and sigma cleaned up. Fixed minor deblobbing bug in iwlwifi. Accept nouveau's new built-in FUC with accompanying source code (some nv cards remain limited by the lack of Free microcode). Dropped deblobbing for removed westbridge, ip2main, and myri_sbus drivers. Adjusted deblobbing for mach-imx, ft1000, brcmsmac, brcmfmac, mwifiex, dib7000p, and others. Jason Self's Freesh apt repository carries binary .debs for 32- and 64-bit x86 systems, and support for more architectures is planned. Thanks! Newly-added mwifiex, rtl8192se, vub300, lpfc and wm8994 cleaned up. Updated deblobbing of ath6k, drxd, bnx2x, brcmfmac, rtl8192ce and rtl8192cu. Dropped deblobbing for upstream-removed rt2860 and rt2870. Gökdeniz Karadağ tells us linux.org.tr is a new Linux-libre mirror. Thanks! Newly-added technisat-usb2, fm_drv (WL128X), rtl8192cu, ums-eneub6250, and snd-usb-6fire cleaned up. Adjusted deblobbing of computone, cyclades, isi moxa_intellio, dib0700, cx23885, bnx2, brcmsmac, iwlegacy, iwlagn, rtl8192ce, rtl8192u, r8712u, and atmel-mxt. Dropped deblobbing of dabusb (driver removed from upstream, with blobs left over) and dx-sep.
Nouveau requested blobs again, large ones this time; radeon required more blobs for new cards; newly-added wl1273, rtl8192ce, can_softing, and re-introduced dx_sep depended on blobs; bnx2 and bnx2x had updated blobs as usual; r8169's blobs were moved out of the sources; dabusb, vicam, wl1xx, serial_cs, icom, and serial_qe were moved about in the tree; bcm_wimax and snd_intel_sst required deblobbing updates; 3c359 had its harmlessly-buggy cleaning-up fixed. The README blurb, the loading of PCMCIA CIS files and the fix for the message that recommended the installation of non-Free Software were all backported to the following releases: 2.6.36.3-libre1, 2.6.35.10-libre3, 2.6.34.8-libre2, 2.6.33.7-libre1, 2.6.32.28-libre2, 2.6.31.14-libre4, 2.6.30.10-libre3, 2.6.29.6-libre3, 2.6.28.10-libre5, 2.6.27.57-libre5, as well as their baselines 2.6.36-libre1, 2.6.35-libre3, 2.6.34-libre2, 2.6.33-libre1, 2.6.32-libre2, 2.6.31-libre4, 2.6.30-libre3, 2.6.29-libre3, 2.6.28-libre5, 2.6.27-libre5. The deblobbing scripts in 2.6.37-libre were updated with cosmetic changes that did not change the output. Patch files between base releases and from base to patch release are now GPG-signed, compressed with both bzip2 and lzip. The tarballs for older releases, containing the Free Bait freedom bug, were removed, and the xdeltas and scripts moved to old/gen4. New README blurb about Linux-libre, re-enabled loading of PCMCIA CIS files found to be available under Free with sources elsewhere, adjusted Libertas drivers to accept user-specified firmware, fixed error message that recommended the installation of non-Free Software, removed the newly-introduced blobs from 5 new drivers, disabled requests for blobs from 10 new drivers, updated the cleaning up of 5 drivers, removed the deblobbing of 1 blob-dependent and 1 blob-in-sources driver dropped from staging. Deblobbed 2 new blob-dependent drivers, adjusted the deblobbing of 3 others, dropped deblobbing of nouveau, now blob-free, and of a dropped driver. Read the announcement. Fixed a deblobbing error in drivers/net/e100.c. Fixed a deblobbing error in drivers/media/video/s2255drv.c. Cleaned up 4 new blob-dependent drivers in 2.6.35, fixed a deblobbing error that caused compile errors in r8192S_firmware.c in 2.6.34-libre. Cleaned up 9 new blob-dependent drivers in 2.6.34, updated cleaning up of a couple others. New, much faster deblob-check, based on Python, GNU awk, PERL or GNU sed, at your choice. Updated for 2.6.33. Blobs are growing faster than Linux. Read the announcement. Released 2.6.27 baseline and 2.6.27.41 deblobbed with updated deblob-check and deblob-2.6.27 scripts. Updated for 2.6.32, fixed deblobbing bugs (some cosmetic issues, some compile errors in a few drivers in staging, such as ME4000, RT2670, RT2680, and RT3070) in 2.6.31 and 2.6.30. Backported the newer deblobbing of Radeon, R128, and BNX2X to 2.6.30. Untested backports to earlier kernel releases are in the SVN repository. Fixes deblobbing errors in usbdux staging drivers, reworks the deblobbing of Radeon, R128 and MGA drivers, in preparation for removal of the firmware from upstream, and improves operation with --force for better operation with already-deblobbed kernels and other variants. Broadcom b43 WiFi should now work with the Free reverse-engineered firmware. Other than that, this release just updates to the deblobbing machinery to deal with all the upstream shuffling and addition of non-Free firmware and of dependencies on non-Free firmware. This release fixes regressions in e100 and radeon introduced in the gen2 releases, and fixes a few deblobbing errors. Read the announcement. We're going to print T-shirts with Freedo. Check out the design and colors here. Get them first at FISL 10. This release makes the 2.6.27 series suitable for use in Free System Distributions, after backporting and adjusting the clean-ups already available in 2.6.28-libre2 and 2.6.29-libre. 2.6.27.21-libre1 is also available. The 2.6.28-libre2 release fixes a number of problems in 2.6.28-libre1: some compile errors caused by deblobbing, a few missed non-Free firmware names and references to non-Free firmware, and some shell scripting portability issues. 2.6.28.9-libre2 is also available. The 2.6.29-libre release uses the same deblobbing infrastructure as 2.6.28-libre2, but it's updated for 2.6.29, and adapted to deal with the pieces of non-Free firmware and drivers that require external non-Free firmware added to the upstream release. This is the first release completely suitable for Free System Distributions: not only does it remove non-Free Software (and brings back some data tables that used to be removed in earlier release), it also removes requests for and documentation that induced users to install and use non-Free Software. Get the slides and the audio of the launch speech at the Libre Planet 2009 web site. The removal of non-Free bits from the kernel Linux is accomplished with the script deblob-main, that in turn uses deblob- and deblob-check. deblob- is inspired in gNewSense's scripts, later customized for BLAG by Jeff Moe, and then further improved as part of the linux-libre project. deblob-check is a script that you can use to test whether a kernel source file, a patch or a tarball, contains any remaining or suspicious firmware blob. scripts/deblob-main: The main script to clean up a linux tarball. scripts/deblob-check: A script that recognizes and optionally cleans up blobs. scripts/deblob-$ver: Scripts that clean up blobs from within exploded Linux source trees. scripts/README: More details on usage of these scripts. releases: Branches and tags of released scripts. freed-ebian: Scripts and diffs used to maintain freed-ebian packages. lemote: Scripts and diffs used to maintain freeloong GNU Linux-libre binary packages for Lemote Yeeloong notebooks running gNewSense. Jason Self maintains both the Freesh apt repository with .debs of recent Linux-libre releases for 32- and 64-bit x86 and powerpc as well as the libeRTy apt repository which carries .debs compiled with the PREEMPT_RT patch for realtime operation on 32- and 64-bit x86 CPUs. Read more. Robert Musial has built DeCentOS RPMs. BLAG ships our Freed-ora kernels. GdNewHat used to do that, too, before it merged with BLAG. gNewSense ships Linux-libre kernels. They used to be cleaned up with an older approach, but current releases use current deblobbing technology. For Lemote Yeeloong mipsel notebooks, see our repository. Damián Fossi maintains Linux-libre binaries for gNewSense/MIPS (for Lemote Yeeloong laptops), and for Canaima GNU/Linux. Henry Jensen maintains the slack-n-free repository, with ConnochaetOS' GNU Linux-libre packages, so that they can be used on distros that cut non-Free Software too much slack. 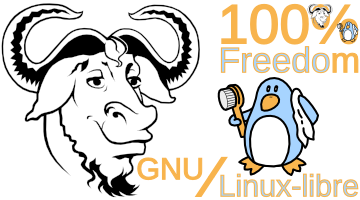 FreeSlack also includes GNU Linux-libre packages in its installable images. VENENUX GNU/Linux switched to Linux-libre as of its 0.8-rc3 release. Trisquel ships 100% Free Linux kernels, based on Linux-libre from version 2.1 onwards. Drágora GNU/Linux has shipped Linux-libre in all of its releases. Kongoni has adopted Linux-libre as of the Nietszche release. VegnuX NeonatoX GNU/Linux has shipped Linux-libre since the 0.48 release. Amagi is a gNewSense-based distro for Lemote Yeeloong laptops. Parábola GNU/Linux has Linux-libre binaries in its package repositories. If you use the distro on which Parábola is based, these packages could turn it into Freeda d'Arc. ConnochaetOS is a light distro, also with Freeda d'Arc potential. RMS GNU/Linux-libre (RMS's Mostly Slax) shipped Linux-libre in a Live pen-drive light distro. Tlamaki GNU con Linux was based on Trisquel, but it rebased, becoming a FreedSUSE. Musix GNU+Linux's adoption of Linux-libre is underway. Dyne:bolic is going to have Linux-libre in its next release. Heads, also from the fine Dyne folks, is a Tor-enabled liveCD that uses a security-hardened kernel cleaned up with our deblobbing scripts. Genfree ebuild scripts are available too, thanks to Nick White. There are binary packages for Arch [GNU/]Linux. 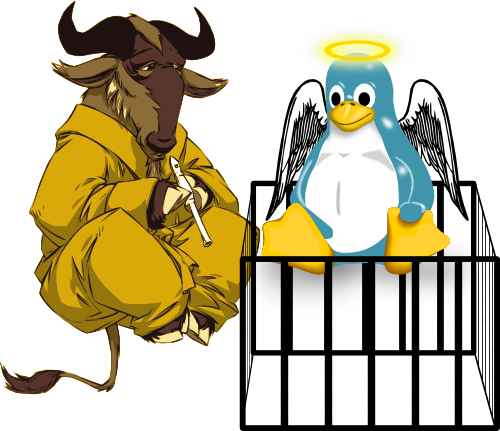 The “Linux Libre Packages” team maintains binary packages of GNU Linux-libre for free human beings. 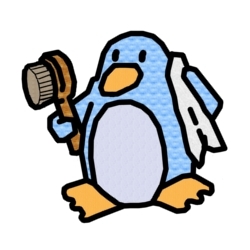 Aurélien Desbrières used to build Linux-libre/planet .debs for x86 out of Linux-libre tarballs, for general use. Read more. Ali Gündüz used to do that, too. Juan Jacobo Nájera used to maintain the rt apt repository with .debs with real-time support. Read more. James Turner used to build binary .debs of recent Linux-libre releases for Lemote Yeeloong (mipsel) netbooks. Robert Millan used to build Freed-ebian packages. If you roll out your own generally-available Linux-libre-based binaries, let us know. 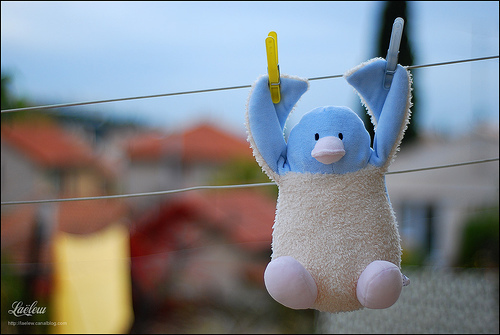 The hanging penguin picture was taken by Lewis Laë in November, 2007, and he was kind enough to grant us permission to use it as a logo, in private e-mail. Merci beaucoup, lew! Anyhow, the picture didn't make for a very good logo. The penguin is cute and clean indeed, but he's still a prisoner. That's why we call him Stux. 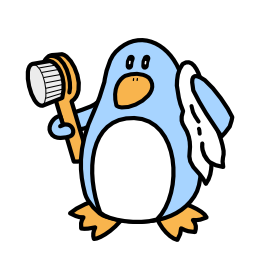 Burnaron drew the penguin getting out of the shower (thanks!). He posted a too. We call him Freetz. Rubén Rodrígues Pérez gave, erhm, birth to Freetz's younger brother, Freedo, our official ( ) logo. The name was suggested by Jeff Moe. Fernando suggested a grey version for printing in fewer colors. The final touches to Freedo were given by Islene Calciolari Garcia and Alexandre Oliva. Alexandre Oliva combined Freedo with GNU, creating the image at the top of the page ( ). Binaries published by the Linux-libre project are going to be configured to display this logo at boot up. 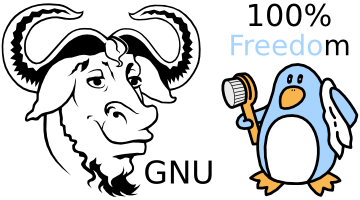 If you want to use it too, look for patches named 100gnu+freedo.patch, in directories named after Linux-libre builds within SVN repository. A few kernels used an older variant ( ). Guillaume Pasquet drew Lux, the holy free penguin (thanks! ), based on Larry Ewing's original tux; both must be credited for this art work. Here's a version. 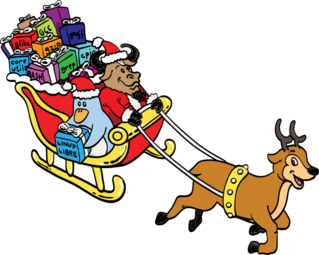 Alexandre Oliva put together the levitating gnu, and Lux, being levitated out of the cage. This picture (and the corresponding sources) are licensed under the same terms as the levitating gnu: GPLv3+ or GFDL1.1 without invariant sections, front or back cover texts.